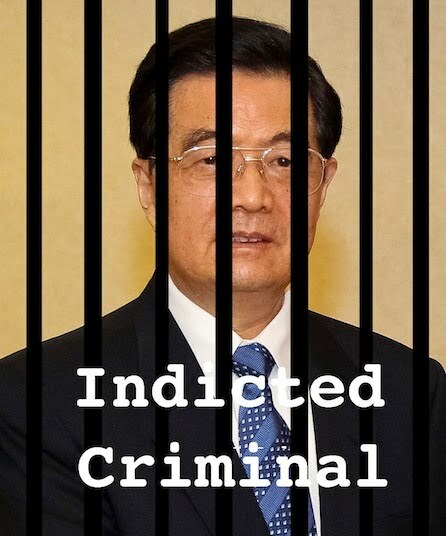 Hu Jintao's Genocide Indictment: What Does it Mean? HU shuffles into his private study, five months after his retirement as Chinese President. He is wearing his favorite bunny slippers. SECRETARY: "Comrade Hu, I'm afraid I have some bad news for you. The so-called Spanish National Court has just so-called indicted you for so-called 'genocide' in Tibet, due to a universal jurisdiction lawsuit brought by a group called CAT. This was reported this morning in major global media including the imperialist BBC, hegemonist AP, gaullist AFP, and even the South China Morning Post from China's Hong Kong. HU: "What? What are you talking about? I just woke up." SECRETARY: "Sir, unfortunately you are now a criminal defendant and an indicted genocidaire. The Spanish Court formally accused you of being responsible for coordinated actions aimed at eliminating the population and country of Tibet. Supposedly, this was by imposing martial law, carrying out mass sterilizations, torturing dissidents, and forcibly transferring in Chinese in order to dominate and eliminate the population and country of Tibet. I mean 'so-called country'. This relates to your time as Party Secretary in Tibet, as well as your time as President of our Glorious Motherland." HU: "Do you mean that some Spanish court recognized Tibet as a so-called occupied country? I thought we buried that truth a long time ago. We've gotten everyone to recognize Tibet as part of the Motherland, right?" SECRETARY: "Unfortunately not, sir. The Spanish Court looked at the facts and the law, and determined that Tibet is a so-called occupied country. This is huge setback for our global propaganda efforts, especially as it comes from what many gullible foreigners will consider a so-called impartial tribunal. "Even worse, the Spanish court made it clear that your so-called genocide was directly aimed at the 'country' of Tibet. This means that this is not just an issue of individual rights or minority rights. This means that so-called human rights abuses against Tibetans are linked to our efforts to secure our rightful sovereignty over our Tibet Region. In other words, some pesky human rights issues are actually linked to Tibet's so-called political status. And that is very bad indeed for our Infallible Party." HU: "Yes, I guess that's really bad for us. That audacious Spanish Court is attacking the heart of our sacred 'core interest' to control Tibet. The nerve! Well anyway, why should I care? This is just a futile symbolic act by one court in one tiny European country. How can this possibly affect me?" SECRETARY: "Comrade Hu, do you remember when you met General Pinochet of Chile at a Global Tyrant's Club meeting back in the 1990s?" HU: "Of course! Good old Augusto. When he told me how he used to fly dissidents over the ocean and push them out of airplanes, I laughed so hard I nearly wet my pants." SECRETARY: "Well, sir, the Spanish National Court indicted General Pinochet for genocide, just like you. When Pinochet traveled to London in 1998, the Spanish Court issued an arrest warrant and the British arrested him. This was shocking because Pinochet was friends with Margaret Thatcher, but in Britain they have something silly called 'rule of law' where the judicial process is insulated from politics. Pinochet was placed under arrest, and nearly extradited to Spain to stand trial. He was only released back to Chile on humanitarian medical grounds. The Spanish Court brought another genocide lawsuit against an Argentine officer called Adolfo Scilingo, and he is rotting in a Spanish prison right now, sentenced to 640 years." HU: "Wait, you're telling me that if I travel to Spain or the European Union, I could be arrested? Me, Hu Jintao?" SECRETARY: "You are correct, sir. You are now a criminal defendant, and the Spanish Court can issue an international arrest warrant for you. I'm afraid it also looks like the Spanish Court can try to freeze your international assets." HU: "You mean like Bo Xilai's $2 million villa in France or his overseas bank accounts? Well, unlike ex-Comrade Bo, I am a simple man and I have no overseas assets, but..."
SECRETARY: "Right sir, whatever you say." HU: "Wait, can't I just get on the phone and get the Spanish government to kill this, like I killed all those Tibetan protesters back in the day? Or what about hoping that the so-called Tibetan administration in Dharamsala to kills this, like they called off those annoying protests when Jiang Zemin and I visited the US?" SECRETARY: "Well, sir, as I mentioned, Spain has this silly thing called 'rule of law'. And I know what you're thinking about those Tibetan exiles. Unfortunately in this case, they seem to be standing up for themselves: one exile MP is an actual plaintiff in the Spanish case, and two exile MPs recently brought a private member's resolution in the exile Parliament to support the Spanish case. And the so-called Tibetan exile Foreign Minister issued a formal statement supporting the Spanish case. I don't know what's gotten into those Tibetans." HU: "Gàn! Those Tibetans are nothing but trouble!" SECRETARY: "You are correct again, sir. Unfortunately, it's my duty to tell you that you are also in trouble. You can't travel freely any more, and we need to worry about your international assets. We might be able to pressure countries to resist this upstart Spanish Court, but that's what Pinochet and Scilingo thought too, and look what happened to them. Unfortunately, sir, the Tibetans and their allies have just won a huge victory against you -- and it might get even worse."